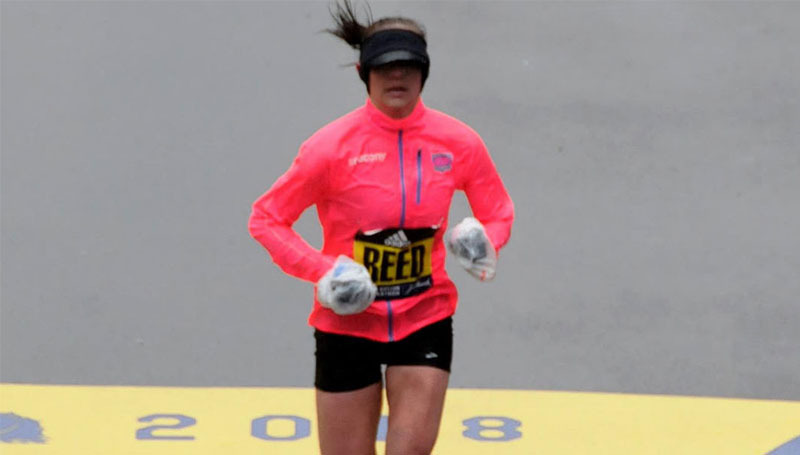 To say that the weather conditions during the 2018 Boston Marathon were unfavorable would be a bit of an understatement. Temperatures hovered at just above freezing, while rain and wind gusts nearing 20 mph pummeled the more than 27,000 runners who turned out for the event. Among those runners was Kimi Reed – a former All-American distance runner at Missouri Southern – who went into the 122nd annual race hoping for a Top 15 finish. Reed (formerly Shank), who graduated from Missouri Southern in 2010 with a degree in health promotion and wellness, turned in an even stronger finish than she had hoped for. She crossed the finish line at 2:46:47 – eighth place among all the female runners. How were you able to push through the terrible weather? It was as miserable as it looked on TV. The conditions clearly affected everyone and I just happened to outlast it better than some. I think the cold/rain helped me finish higher as several of the Ethiopian and Kenyan ladies did not finish. I started thinking back to all the “good luck” wishes I had received the days before the big race, and that helped me get to the finish line. What was your training process like? To prepare for Boston, I ran more miles than I have ever run in my life. I topped out with a 100-mile week in the peak of my training. I also had several weeks that totaled 80-90 miles per week in my build-up. My shoes were getting more miles per week than my car was! A lot of my speed workouts were the same. However, to prepare for the net downhill race, I added a new workout of downhill repeats (much easier than uphill repeats). This was to prepare my quads so that they wouldn’t get sore as the race went on. What did you learn from your time running for Missouri Southern? I learned that you never know who will show up on race day. This race reminded me of my junior year at MOSO, when I was runner-up at the NCAA Outdoor Track and Field Championships in the 10k. I barely snuck into the race and ended up second place! I was always just so consistent/dependable in my racing and training. Do you plan to run the Boston Marathon again? I have been told by locals that I didn’t get the “full Boston experience” because the weather kept several people from being out there. My husband, Marshall, and I are already looking forward to possibly making the trip again next year. My next goal is to run an Olympic “A” standard of sub 2:37, which I will attempt this December at the California International Marathon in Sacramento.